John Gornall joined the Northern Rhodesia Police in January 1958 just as I left the Training School. Our paths only occasionally crossed before I retired from the Zambia Police in 1966. He served on to 1967. He does not set out to give a chronological account but a collection of observations and anecdotes. He tells us little of his first three year tour at Kabwe, and back at the Training School as a language instructor, rather more of problems and personalities in the early years of Zambian Independence from 1964, but the core of the book concerns his second tour in charge of Chisamba Police Station in a farming area between Kabwe and Lusaka. Nothing can be more satisfying for a young officer than the command of his own station but Chisamba also gave him the opportunity to shoot, to meet his future wife, and learn the ways of the Lenje tribe. Hence the title for what is really a sad book, as must be any account of the years which saw the birth pangs of Zambia. John Gornall's parents-in-law like many of their neighbours had to leave their farm. His mother-in-law was later murdered by guerillas in Ian Smith's Rhodesia. Most European officers took an interest in the customs of the people they served. Few took such a thorough interest as John Gornall who went on to make it the subject of a university thesis. More typical of his fellows was his striving to find an effective and fair solution to every problem. Gornall was an efficient and energetic officer who earned the respect and affection of his subordinates, and not just for supplying them with meat! Gornall did not see eye to eye with two of his expatriate seniors. I knew neither of these officers. One died shortly after the events described and the other was close to retirement. John Gornall may have felt unable to avoid identifying them, but he could have made his points with more circumspection. The results of his studies run as a theme through the whole book. He blames tribalism, fatalism and the belief in witchcraft, together with Britain's precipitate scramble out of Africa, for most of Zambia's problems. He records his understandable relief at receiving a posting back to Training School on promotion at Independence, but he did not entirely avoid the frustration of encountering political interference in front-line police work. Chronology is not his strong point. Stewart Gore-Browne came to Northern Rhodesia with the Boundary Commission in 1911, not after World War I which is when he returned to settle. Cirupula Stephenson was not a district commissioner in the 1920s. He resigned from government service in 1907, the year given by Gornall for the defeat of Mlozi. Mlozi was defeated and hanged in 1895, not on the Luapula, but in Nyasaland. Nevertheless the forerunners of the Northern Rhodesia Police were engaged in the suppression of the slave trade into the early years of the 20th Century. The book finishes with letters from two friends. The first describes a visit to Zambia in 1998 and paints a depressing picture. 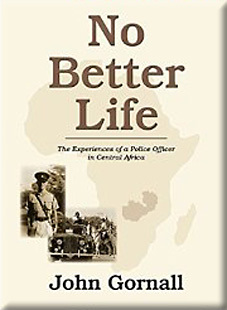 The second describes the successful visit to Zambia by members of the Northern Rhodesia Police Association in 2004 and indicates that despite AIDS and other problems there is good reason for hope for Zambia's future.